In times of uncertainty, people look to leaders for guidance. Whether the future of a business is on the line, a family member is at risk or a community needs help, leaders are those who take command of the situation. Leaders inspire transformation and action when it’s needed most. What if you could be that leader? What if you could understand the patterns behind conflicts and have the knowledge and training to effectively resolve them? What if you could become the person that others inherently trust to guide them through the most challenging situations? In this 10-day program, you will learn how to be a true leader – someone who does not force action, but rather empowers others to overcome obstacles and transform their lives in a positive way. 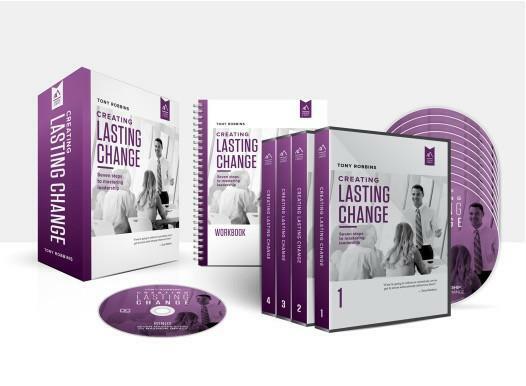 Instantly understand the reasons behind people’s actions and discover how to leverage those to create a shift in their psychology, resulting in a strong, desired outcome. These are the very same strategies and tools that Tony Robbins has employed in his own interactions with the millions of people who have attended his events. Leaders aren’t born, they’re made. Anyone can become a great leader. Start your training today with this risk-free opportunity! An introduction to exactly what it is that makes a leader and a review of the 6 historical philosophies of the human psyche. Learn what the master steps are and how, once you master this process, you can apply them to influence and inspire others both personally and professionally. Before you can move others to action, you must first understand what drives them, including their needs, fears, values and the rules they live by. Discover the strategy of genuine connection and how it can be used to close deals. Discover the method that Tony uses to get leverage with others, including the 3 keys to framing and how to uncover each person’s emotional threshold for change. The first step to enacting change is breaking someone’s patterns. Using personal experiences with clients, Tony demonstrates how to shatter harmful patterns they’ve been using for years and to replace them with empowering ones. Problems can seem overwhelming when seen all at once. Learn how to break down any problem into smaller, addressable parts, and how to redefine it so it’s more approachable. Identify the disempowering ways a person is meeting their needs, then help them see clearly how they can meet those same needs in a way that has both short-term and long-term rewards. Now that you’ve identified an empowering alternative, you have to make sure it lasts. Tony demonstrates how to anchor a change and reinforce it for lasting impact. Discover the psychology Tony uses to raise people’s standards, the power of a peer group and how to create a supportive environment that catalyzes positive change. Using everything you’ve learned, identify where you are as a leader and how you can use your strengths to affect change in any person and in any environment.